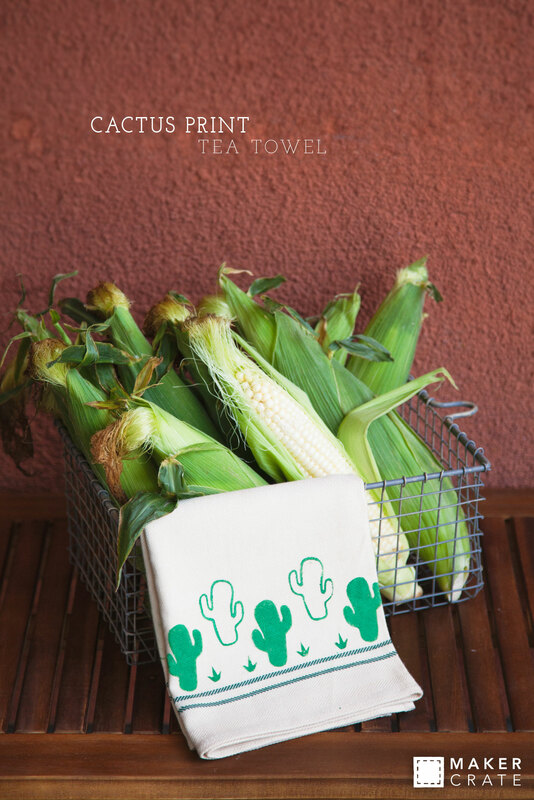 When the idea came to me for this tea towel, I could picture the print in my mind, but was having trouble finding the perfect cactus stamp. So I decided to carve my own! I love the creative freedom of carving stamps, and this unique, fun print turned out exactly as I envisioned. Use a pencil to sketch out your cacti into the Speedy-Carve. This will help guide you when you start to carve. Use a craft knife to cut a rectangle out the large stamp block. Next, use your tool to carve out the design. I carved three stamps--a basic cactus, a cactus outline, and a small tuft of grass. Mix the green paint and textile medium according to the instructions on the bottle. Place a sheet of thick paper behind your tea towel to prevent the paint from seeping through to your work surface. Using a foam spouncer, apply an even coat of paint to your stamp. Press your stamp down with even pressure and gently lift up to reveal your design. Alternate different stamps to create your own interesting pattern. Let the paint dry, and your towel is complete!